The final job I had for the 888 was to replace a leaking base gasket on the horizontal cylinder. An easy enough job, filling in a Saturday when done at that casual Saturday pace. Unfortunately, it went bad part way through. When I had the cylinder off, it occurred to me that I should quickly check the big end plug in the crank. Just one of those offhand visual checks to make sure all was ok. It wasnt. The plug was coming out and rubbing on the LH main bearing outer race. The photo below shows what I saw with the horizontal cylinder off. Although you cant actually see the plug, you get the general idea of why its such a problem. Absolutely no access. Well, this really sent the day down the shitter. I wandered around for a little while, looking and cursing and deciding what the hell I should do. I even rang Mick (our ex mechanic who unfortunately for us decided to go back to the police force) to see what he would say. I poked in to see how lose it was, and managed to turn the plug a little with the end of a screwdriver, so it was definitely on the way out. Although it cant actually come all the way out in theory, it rubs/wears/rotates a little at a time as it moves out, filling the LH main with aluminium slithers. We have seen this kill main bearings in the past, so its a problem to be taken seriously. Ignore it and just put the cylinder back on. Pull the engine and fix it. As much as I wanted to just ignore it, my conscience wouldnt let me, so the only decision I could come to was to pull the engine. Bugger. The next day (luckily the Sunday of a long weekend) I enlisted Mick and Bob (parts king) to drop by for a little Sunday engine pulling. Not that big a job, especially using the engine jig I made a few years ago. Basically a cradle with handles out either side, and a bolt for the lower rear case through hole, this lets you easily manoeuvre the engine out and carry it away. Although its main purpose was to reduce the effort or re-installation greatly. Made much easier with three people, as that way you have someone to remove the engine bolts while the other two hold the cradle. Easy. Well, for a 916, etc family of bikes it is. Because on the 888 the swingarm pivots in the cases (and not the frame as the 916, etc family do), I made some plates that bolted to the foot peg mounts with pins that went into the outer ends of the swingarm. So I could knock out the swingarm pin with the engine supported, then fit the plates and it would all just sit there without the bike falling in half. With the engine out its another quick job to strip it down to bits. Even the primary drive crank gear played along, coming off with the hydraulic puller nicely, with out the need for the heat gun or big brass drift. So, an hour or so later, it was just a bench full of bits. The photo below shows the offending piece, for the benefit of those who have absolutely no idea what Im talking about. This photo shows the lot installed with the plug loctite'd back in and the LH case about to go on. You can also see the Pankl steel rods that the Stradas supposedly didnt have. I also took the chance to give the cases a coat of paint, as the original was a bit second hand. Made the whole lot look much nicer, although it meant a weekend spent mostly at work. Reminding myself I was improving the resale kept me going. I had to do a couple of things for reassembly though. I replaced the main bearings and the big gearbox bearings behind the clutch and the sprocket, as well as a couple of seals. 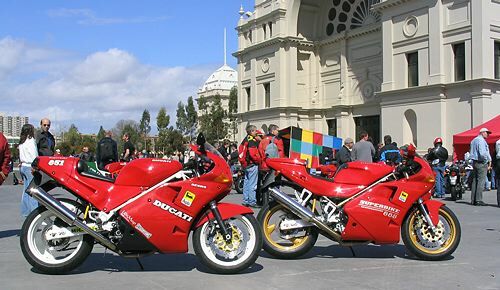 Given the new bearings, and I wasnt using a centre gasket  Ducati stopped using them around 96 and, although I could probably get one from Gowanlochs, we didnt have any on the shelf  I had to reshim the crank, gearbox shafts and shift drum. The gasket was 0.3mm compressed, but I ended up with the same shimming on the crank and gearbox shafts, with a little less on the shift drum. So the crank was loose anyway, and we could feel a bit of movement before we split the cases. The main change was omitting the base gaskets. This drops the cylinders and heads 0.3mm, taking a bit over 2cc from the clearance volume, as the piston is 0.3mm closer to the head. 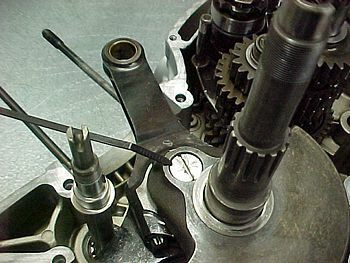 Most of the 4V engines have a std piston  head clearance setting of 1.3 or so mm. The base and head gasket dimensions changed around 99, when they started using thicker base gaskets  around 0.6mm  and thinner, steel shim type head gaskets. The older 888 has the thick, rubbery/fibre sort of head gasket (the ones that wont come off) which are around 1.3mm thick. So, with the piston now sticking out of the bore about 0.3mm, the piston  head clearance was down to 1.0mm, right about where I would want it. I wasnt sure at the time of how much effect it would have on the comp ratio, but was quite surprised when I worked it out. The 888 is quoted at 11.0:1 comp ratio std, although Id expect it to be closer to 10.5:1. Either way, pulling the base gaskets will raise the comp around half a point, from 11.0 to 11.5:1 for example. Cool! 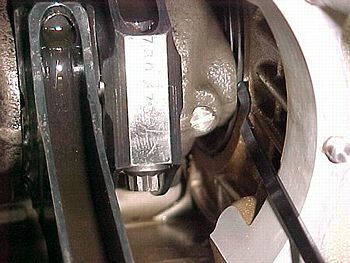 Reducing the distance from the piston to the head at TDC also reduces the "squish" clearance. Which means more of the mixture in the cylinder gets forced out from the edges of the cylinder into the combustion chamber as the piston moves up to TDC, resulting in a more complete and cleaner burn. Less squish distance also means that less combustion can take place around the outer edge of the cylinder, effectively reducing the distance the flame front has to travel prior to TDC. This is actually a "not quite that simple" thing. Neil Spalding, who writes the Sigma Performance site, has done a good article on this. Going back to my car days for a minute, I remember a guy who did lots of V8 stuff telling me he had stopped a Holden 4.9 litre (304 cu in) engine detonating by removing the 304 crank and fitting the just a tad longer 308 crank. The difference in stroke is 0.9mm, giving a difference in squish clearance of 0.45mm. This raised the comp slightly, but also reduced the squish and eliminated the detonation. So squish is a very important thing, for reasons relating to the very complex nature of combustion, and something well worth attending to if pulling the heads. Not that I would pull the heads just to do it, though, unless we were getting very serious. Leaving the base gaskets out probably isnt the most correct way of doing it either, but it does get the job done just fine. As does the Three Bond/Ducati Grey sealer. I also took the precaution of plugging the oil gallery that is drilled through to the vertical cylinder base. The crankcases used for the 4V engines are also used for the 900 and ST2 2V engines, which feed oil to the heads through the cylinders. The 4V cases still have these oil galleries drilled, even thou they arent needed. The 4V cylinders are blank where the 2V cylinders have the oil gallery, and the sealant used, along with an o-ring on the vertical cylinder, stops the oil coming out. Removing the base gaskets means the o-ring that normally lives in the recess machined in the cases of pre 01 engines would be squashed quite a bit more than it should be, so in anticipation of the slightest chance of a problem I plugged the gallery with a 4mm grub screw. Easily done, the grub screw can simply be wound in, forming its own thread as it goes. I then removed it, cleaned any oil, etc off and refitted the screw with Red Loctite. Red Loctite is one of those things Im slightly "superstitious" about (for want of a better word). We normally use Wurth brand thread lockers in the workshop, but if I need to lock and seal a threaded plug, its Red Loctite (262 from memory) that gets the job. I first used it on those gallery plug behind the starter motor years ago, which is one of those "need to do it once" type jobs, and it worked just great. This procedure works a treat on S4 Monsters too. Removing the base gaskets also effects the cam timing, retarding the cams a little. I calculated this also, as I was thinking of measuring it, but couldnt be bothered setting everything up (at least an hours job from start to finish). Assuming the extra 0.3mm of belt would be effective at the pullies outer diameter of 53mm, removing the base gaskets would retard the cams by approximately 1.5 degrees, maybe 2 degrees at the most. Not enough to worry me at this point, and it put the exhaust cams where I would normally set them anyway. If I had used adjustable pullies, I may have entertained the idea of resetting them all, but probably not. Two degrees of cam timing will make a little difference, but not that much. So, I put all the bits back inside as required - well, as the book told me. I always use the manuals when doing the inside-the-case bits, just because I dont do it enough for the job to be second nature, although the older Cagiva/Ducati manuals are probably vaguer than my memory. I did forget the shift forks one time quite a few years ago, but it didnt take me too long to work that out (advice  check gear selection as soon as youve torqued all the case half bolts). Has made me a little paranoid, which is usually a good thing for this kind of work. However, for some reason, Im always far more paranoid with my own bikes than with a customers. Dunno why, and it really makes no sense. Its even worse when its time to start it. Even after all these years, firing a rebuilt engine is a scary time. But, it started just fine, had lots of oil pressure and no unexpected noises, so thats about all you can ask for. I had to refit the original exhaust system, as the bike was to be inspected for registration. After that was done, I fitted the full Ducati Performance ST4 system for the final time (woo-hoo) and headed for the dyno, just to see what difference leaving the base gaskets out made (and maybe the reduced drag of a crank plug rubbing against the LH main). The graph below uses about 5% less fuel than was used for the previous DP exhaust curves, due I would expect to the reduced squish giving better, more complete combustion requiring less fuel. A small improvement, mainly top end, but it does certainly help with that hole from 7  8,000 RPM, and makes the curve that little bit flatter overall. The slightly different cam timing (as mentioned above, due to leaving out the base gaskets) may be why there is no improvement under 6,000 RPM, now that I think about it. I also tried removing some ignition advance, as I had done previously. 42 degrees max again made a little positive difference to the output (and 38 degrees max a noticeably negative effect again), so I got Duane to make me the custom chip, with both fuel and spark map revisions. The graph below shows std spark advance (up to 46 degrees max by 9,000 RPM) in green and 42 degrees max advance in red. A very small difference, but it is certainly happier with a little less in the 7  9,000 RPM range. And running the least amount of ignition advance you need to make the power is always a good idea, particularly given that all these runs were done with good, premium unleaded fuel. The next two graphs show the end result (running 42 degrees maximum ignition advance) in red, compared to the previous reports best (again, 42 degrees max ignition advance) in blue and the all std run in green. First is power, the torque. The final result looks even better now compared to std, and feels very good on the road. The engine accelerates very quickly, arriving at 9,000 RPM almost before youre aware of it. The dip from 7  8,000 RPM is not at all noticeable in the lower gears, and I havent had it that fast in a higher gear to know if you can feel it yet. Overall, just like my 851, but with another 12 hp. Speaking of the 851, the final graph shows the end result from the 888 compared to the 851 as it currently sits (ignored and unridden for nearly 7 months now, poor baby). The runs are road speed based, with the 888 running 1 more tooth on the rear sprocket (15/40) over the 851 (15/39). You can clearly see the difference those 1mm bigger valves, 37 cc and a little comp makes. Although, as my (somewhat dodgy) memory serves me, the 851 isnt much slower on the road under 8,000 RPM. 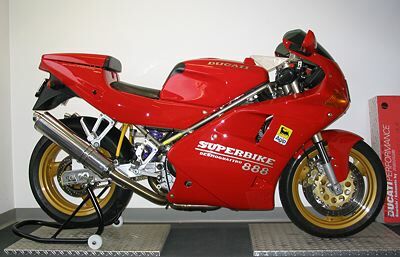 Here's a couple of photos of the finished 888. I wasn't too sure of the wheel colour, personally, until i saw it on the road (being ridden by someone else, of course) on the way home from the Melbourne Italians Days. Then I was convinced. On the road, they look great. Although, I still think the 851 looks better, especially with its Madaz modified Staintune mufflers.